I'm still in walk-about mode, far-far from home. By way of update, the property did not sell, and to that extent the sojourn was a bust. However I picked up a new client (scientific collaboration between Norway and China), with coin to spend and that was good, even though it had nothing to do with the fact that I'm not home. It used to be that the US was at the cutting edge, and though we still are in some areas, the balance has shifted. That's not in small measure due to aggressive industrial espionage on the part of China. The US only put up a token resistance to the theft. If the FBI can be bought by Clinton (who everyone purchased - allowing her to go from "dead broke" to $250,000,000 in her four year term as Secretary of State), can they be bought by China? I don't know the answer to that one. Wiser bloggers than me may wish to opine. (NASA/JPL) You saw it first on the science fiction movie, Red Planet. 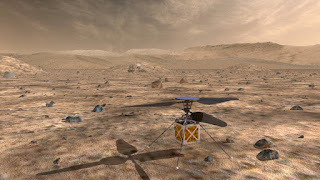 Now NASA is getting closer to putting a scout helicopter on Mars. "The vehicle is envisioned to weigh 2.2 pounds (1 kilogram) and measure 3.6 feet (1.1 meters) across from the tip of one blade to the other. The prototype body looks like a medium-size cubic tissue box." If it eventually flies, it will be on a mission after the upcoming MARS 2020 mission. Those of you who know me, may understand that I participated in a commercial UAV project that involved the entire Planetary Sciences Department at Cal Tech. The project didn't work out and some of them moved on to this. So I do know a bit about it from them. I'm not a rocket scientist like the Grunt of Monte Cristo, but I do have a general grasp on physics and mathematics, which has served me since I became too old and decrepit to be a professional gunslinger, and the ObamaNation killed my desire for public service. The MS in mathematics from the Naval Postgraduate School turned out to be worth something after all. Back to Mars exploration. 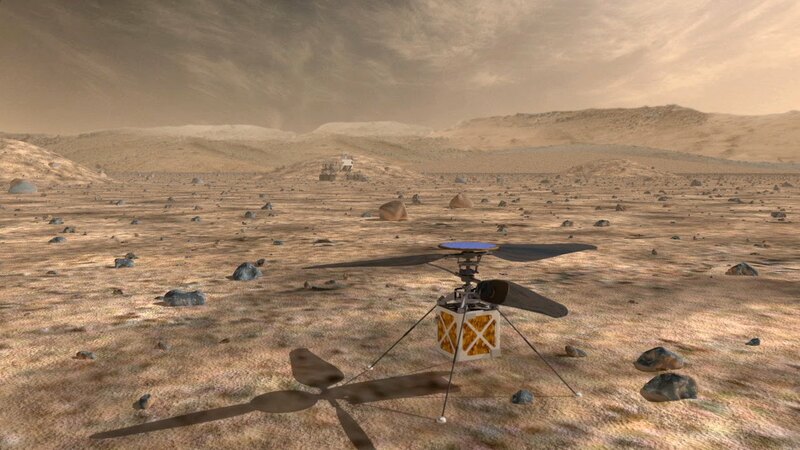 The new smart landing system will allow probes to land anywhere on Mars that scientists want to put them. Expect a more thorough exploration of Mars before a manned mission is taken seriously. Some believe the timeframe for footprints on Mars is 2050 +/-. It will likely be an "international mission" where the US foots the bill, as usual, if the US is solvent by 2050. NOTE: I have no idea whether that will be the case. Based on current practice, we won't be solvent, there will be some sort of civil war and who knows how it will all end? There is no scenario where "America" would "win". An America in free-fall would crash the world economy including the Chinese. A Trump presidency might start a turn-around, but when roughly half of all Americans pay no income tax (and are bought after a fashion), it's tough to see how they can be separated from bread and circus. The Russians scorn weakness and despite the hay that the mainstream media made of Trump saying that Vladimir Putin is a "strong leader", Putin is rubbing Obama's nose in it. The Russians view Barack as a feckless and incompetent goofball. Some Americans agree, but they are both deplorable and unredeemable. The release of Obama's work-out video a few years ago was laughable and got Putin running around shooting deer with archery while naked...or some such, to show the contrast. The Russians mock the vaunted "Clinton Reset". (Fox News) The U.S. is accusing Russia of hacking political sites, saying it is trying to interfere with the upcoming presidential election. Intelligence officials say they are confident that the Russian government directed the recent breaches of emails from American people and institutions, including U.S. political organizations. With a President Hillary totally for sale, you have to wonder if she is beyond selling the Russians a few aircraft carriers and air wings. She hasn't seemed to find a limit yet.